Hamas and Islamic Jihad say that a visit by Obama to the Temple Mount will be a declaration of war on the Islamic world. The Hamas and Islamic Jihad terror groups threatened on Friday that a visit by U.S. President Barack Obama to the Temple Mount during his upcoming visit to Israel will be a declaration of war on the Arab and the Islamic world. A Hamas representative in the Al-Aqsa mosque, Mushir al-Masri, even called for a third intifada (uprising) and for Egyptian assistance in the "resistance" if Obama chooses to visit the Temple Mount. According to the Bethlehem-based Ma’an news agency, the Gaza-based terrorist organizations made the threats during a protest march on Friday over the riots that broke out earlier in the day on the Temple Mount. According to the report, Khalid al-Batash, a senior Islamic Jihad member, also called to prevent Obama from visiting the compound. Obama will be arriving in the region later this month, and PA media has been widely speculating that he plans to visit the site of the Al-Aqsa mosque. However, Washington is not planning such a visit. Political and religious leaders in the Palestinian Authority have stressed that Obama should not visit the Al-Aqsa mosque compound in a way that might compromise what they called its "Muslim sovereignty." "Any visitor is welcome to Al-Aqsa, but they should follow the regulations of the Waqf and enter through the Lions' Gate and not through Mughrabi Gate, to ensure Muslim sovereignty," he said. 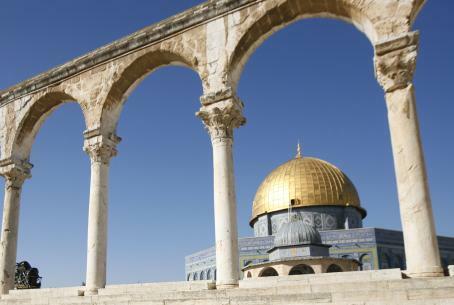 The Waqf, in return, has removed every sign of ancient Jewish presence at the Jewish holy site and has consistently destroyed Jewish antiquities on the Temple Mount in a direct violation of a ruling by the Supreme Court. Several Israeli police officers and Muslim worshippers were injured during the Temple Mount riots on Friday afternoon. The riots began when the worshippers started throwing rocks at security forces. Police stationed at the Mughrabi gate broke in and began to throw stun grenades to disperse the stone throwers. The rioters responded with firebombs. According to the police, nine officers and five protesters were injured during the incident.